Are you looking for a simple way to launch your website or your book? Have you already invested your money into getting your website live or your book published and would now like to let everyone know that your “baby” is open for business? My 7 Step Launch Guide will show you how. 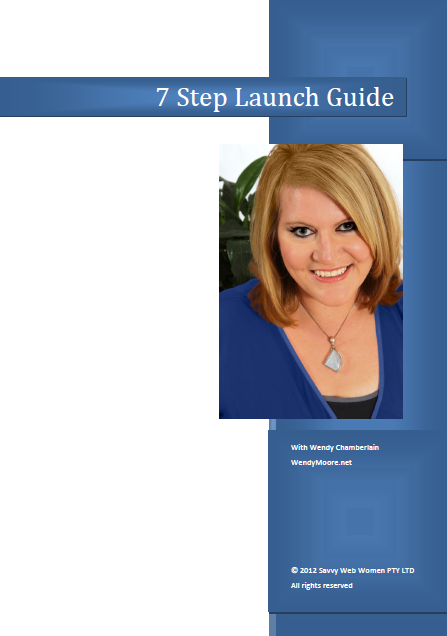 You can rest assured that your launch will go ahead without a hitch when you follow my easy 7 Step Launch Guide. There is nothing more annoying than to spend your valuable time and money planning a launch to then realise at the last minute that you’ve missed one vital, key step. This is always a risk with a launch, because there are so many different things to be mindful of and to coordinate. Your launch is no different. Do you really want to risk missing a key element because you were too busy to plan exactly, step-by-step, what to do and when? how to gather a ground swell of support for your launch – who to contact and how to get them to say yes! Following our 7 Step Launch Guide ensures that your launch will go just as you planned. With our 7 Step Launch Guide, you can rest assured that everything will go off without a hitch, saving you worry and stress. Wouldn’t you like to sleep soundly knowing that your launch will go smooth as clockwork? The issue many people face, is if you’ve never launched before, how do you know you’ve covered all the bases? You don’t know what you don’t know – right? Of course, if you’ve got the spare time to do a little research, you’ll find there is already a lot of information out there on how to successfully launch your website or book. So if that’s your preference, you can spend many, many hours searching online to find exactly what to do. Then there’s the order that tasks need to be done in – what needs to happen before the next task starts. In project management parlance, these are called dependencies. They matter! The problem is, get the sequence of steps wrong and your launch could be an absolute disaster – or it might just not happen! So whilst you may find a wealth of information online explaining to you how easy it is to launch, if you don’t have the sequence of steps in the right order (or don’t have detailed checklists to follow), or vital steps are missing from the entire process, disaster could be waiting for you just around the next corner. How embarrassing would that be? You’ve told everyone about your launch and then – nothing. Whoops! The very last thing you want to happen is to have to move your launch date. It just doesn’t look good. Plain and simple. I understand how daunting it can be to launch your website or book. Particularly when it is a constantly moving target! I understand, because I’ve also successfully done a launch. In fact my own launch, so it was my neck (and reputation) on the line. It took planning. It took determination. It took following a formula to dot every “i” and cross every “t”. That’s why we’ve taken the time to document the exact steps you need to follow for you too to successfully launch your website or book. These are the very same steps I followed when I successfully launched my website www.SavvyWebWomen.com. We followed the 7 Step Launch Guide. 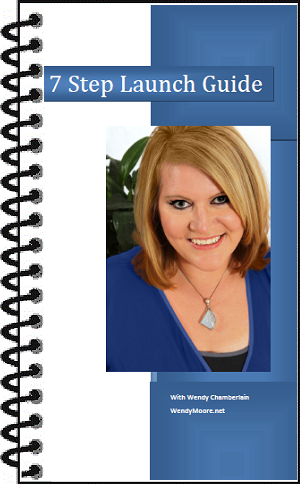 So what do you get in my very special 7 Step Launch Guide? step-by-step instructions on how to get your JV partners onboard. You’ll attract the best JV partners, eager to support you and come onboard for your launch. step-by-step guidelines for instructing JV partners on the sorts of bonuses they should be offering. Weed out the supporters from the self-promoters! An easy to follow Schedule Overview template, fully fleshed out for your launch including the tasks to be performed, due dates, task dependencies and the person responsbile. Just plug in your own resources and you’re away! How to get your launch website sorted – Actual launch page sample examples for you to use as a ready reference guide that visually illustrate how to set up your website for a successful launch. email autoresponder templates (automated emails) to be used to manage site visitors and potential customers taking part in your launch. Get them to stay and play! Email templates to be used to bring your JV partners on board to participate in your launch. Attract the best, forget the rest. Email autoresponder templates (automatic emails) to use to manage your JV partners taking part: before, during and after the launch. Keep your JVs engaged and in the launch loop. Bonus Page Layout – templates to use that show you how to layout your bonus page on your own launch website for maximum impact and visitor engagement. Let’s keep them on the page! Bonus Download Page Layout – templates to use for the layout of your bonus download page on your launch website to make it super simple for your visitors to get their goodies. How to gather testimonials for your product or book and how to use them as part of your launch strategy. Nothing beats glowing reviews from your raving fans. Checklists! Lots of checklists, to make sure you don’t miss a single thing. WOW! Imagine having to put all that together by yourself. The 7-Step Launch Guide is truly an invaluable resource for anyone looking to launch a new product or event.The guide is presented in clear, easy to follow chapters. In each section Wendy Chamberlain walks you through the process of launching a product or event: from defining the event timing and duration to running an effective social media campaign and getting testimonials.A real time and money saver. Wendy Chamberlain has identified every conceivable aspect of successfully launching a product, service or event and offers an insight on how you can get it right first time. Highly recommended. It could not be any simpler than that and that’s what we wanted to give you – something to make it really simple. Dead easy in fact. Just about anyone, can follow our step-by-simple-step, “click and do” instructions to quickly get your launch planned and ready to roll. Even if all this detail is not your thing, hand our 7 Step Launch Guide to your trusted team members and let them get to work on your successful launch. It really can be that simple. If you’re more “big picture” than down with the details, surround yourself with those resources that love all that detailed planning and get them to use the 7 Step Launch Guide. Anyone that can send an email can follow the instructions and use our 7 Step Launch Guide. Right away. 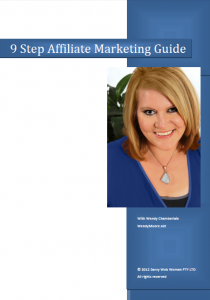 The 9 Step Affiliate Marketing Guide is our very special bonus inclusion for you when you secure your copy of the 7 Step Launch Guide. In reality, our 7 Step Launch Guide is worth well over $2,000, when you consider the time we took putting all the templates together. We then carefully documented the entire process with very clear instructions and checklists at each step so that you’d be able to do the same thing, as simply and as easily as possible. So, Why did I compile this Special Launch Guide for you? So why did I sit down and put together step by step instructions covering exactly what you need to do to successfully launch your website or book? Because when I did my launch, there was no where to get all the information in one place – from someone that had actually done a successful launch. Plus, I love to learn. So for me, it was a perfect opportunity to do what I love (learn stuff) plus help out other busy business owners. I know that many, many people simply don’t have the time to sit down and do the research. They’ve got a launch do to! One of the things I saw that people needed was a quick and efficient way to map out their launch with as little stress as possible. A roadmap, if you will. But the roadmap needed to show the best route and the quickest timeframe to complete the journey, removing all the “pot holes” and road bumps along the road. So I saw it as an opportunity to do something fun plus help out a bunch of folks at the same time. How long have you already spent worrying about how to make sure you’ve not missed a step with your launch? To really feel confident that your launch, the “coming out” of your baby that you’ve nurtured and helped emerge for months and months, will run smoothly. Worrying that you won’t let those closest to you down or be made to look foolish when things simply don’t end up going to plan? If you’re anything like I was, you’ve already spent hours worrying about how to make sure nothing has been missed and everything will go just as you (hoped, prayed and) planned. We took weeks to plan our launch to make sure it was as successful as we could possibly hope – and it was – thanks to the process and roadmap we followed. It’s this very process and roadmap that we then documented for you in our 7 Step Launch Guide. Our 7 Step Launch Guide documents are all for you, with easy to follow, step-by-step clear instructions on what to do. So what is your time really worth? Grab our 7 Step Launch Guide right now, tick that box and move on to making your launch the best event ever. Your copy is waiting for you right now. Just click the link below to order the 7 Step Launch Guide and rest assured that you’ll have at your fingertips all you need for a hugely successful launch. That’s right! Grab our 7 Step Launch Guide, carefully follow and implement all the steps to launch your event or product and if you genuinely aren’t satisfied with the wealth of information provided to you, simply send us back the entire Launch Guide (including removing any templates and returning all checklists) and we will refund your money. P.S. Please Don’t Order this product if you’re looking for a fat book full of fluff. What you’ll get is a complete blueprint of high quality information that is written by someone that has actually run a successful launch. With these templates, checklists and tips, you too could get a fabulous result with your own launch! P.P.S. It literally took us many hours to put this material together for you, after having used it in a live launch scenario. It works! It can work for you too.